Workers on Arriva Rail North are to stage five fresh strikes on Saturdays in the run-up to Christmas in the ongoing dispute over guards. Workers on Arriva Rail North are to stage a series of fresh 24-hour strikes in the bitter row over the role of guards. A planned strike in the long-running dispute over the role of guards on trains has been called off. Rail passengers in the North West face fresh disruption after more strikes were called in the long-running dispute over the role of guards on trains. Members of the Rail, Maritime and Transport (RMT) union on Arriva Rail North will strike for 24 hours on May 9 and again on May 11, 14, 16 and 18 just on SWR. The announcement was made at a protest in Westminster to mark the second anniversary of the dispute, which started on Southern Railway. No fresh walkouts were announced on Merseyrail, where talks are being held to try to break the deadlocked row. Hundreds of RMT members, disability campaigners and passengers joined the Westminster demonstration, which was followed by a lobby of MPs. Rail companies are to stage two 24-hour strikes in worsening disputes over the role of guards and driver-only trains. Members of Merseyrail and Arriva Rail North will walk out on October 3 and 5. The strikes will coincide with the Conservative Party's annual conference in Manchester. Mick Cash, RMT general secretary accused Arriva Rail North of "intransigence", adding: "
The responsibility for the inevitable disruption lies wholly with the company. We are angry and frustrated that Arriva continue to fail to face up to the facts and also continue to ignore a perfectly reasonable union proposal to invite the DfT to join us in round-table talks aimed at finding a solution. "The public, who support RMT's campaign for a guarantee of a guard on their trains, will be appalled that Arriva Rail North have failed yet again to offer any kind of progress whatsoever in the talks and have instead opted to try and bulldoze through their plans regardless." A petition in defence of guards on Merseyrail has attracted over 20,000 signatures. Merseyrail have repeatedly kicked all conciliatory approaches by RMT negotiators back in our faces and made it crystal clear that all that they are interested in is the union signing a surrender document which gives them a free hand to rip apart the safety culture on the railway. "It is that cynical and hostile stance from Merseyrail which has left us with no option but press ahead with a further two days of strike action. "RMT recognises the severe impact that the action will have but we are dealing with an employer that refuses to listen or engage with the union on the critical issue of safe rail operation and we ask the public to understand that we have no option but to take this high-profile action to force the company back to the negotiating table." The Merseyrail strike will coincide with the first phase of work to transform Liverpool Lime Street mainline station by the end of 2018. Between September 30 and October 22 Network Rail will embark on a major project to overhaul the station, helping cater for a predicted doubling of peak-time passengers by 2043. No trains will enter or leave Lime Street mainline station for nine days, and many will be diverted. We are busy trying to build a better city region with an improved railway. "The RMT seem to be doing everything in their power to destroy this work. Don't they want Liverpool to succeed?" Northern is modernising local rail with new and refurbished trains, better stations and faster journeys, and while strike action is disruptive, we remain firmly focused on delivering a better service for our customers. 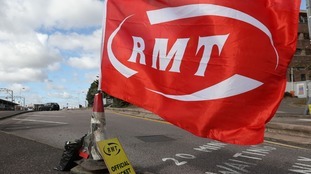 "RMT continues to reject our offers to talk and we are disappointed that the union has called further strike action. "We are still prepared to guarantee jobs and current pay for all our conductors for the next eight years." Rail workers in the north are to launch a fresh wave of strikes in long-running disputes over staffing and driver-only trains. Members of the Rail, Maritime and Transport (RMT) union at Arriva Rail North will walk out on Friday September 1 and Monday September 4. Strikes will be held at Merseyrail on September 1, 3 and 4. The union accused the companies and the Government of pressing ahead with controversial plans to extend driver-only operation. "The responsibility for the inevitable disruption lies wholly with the company. "We are angry and frustrated that Arriva continue to fail to face up to the facts and also continue to ignore a perfectly reasonable union proposal to invite the DfT (Department for Transport) to join us in round-table talks aimed at finding a solution. "The public, who support RMT's campaign for a guarantee of a guard on their trains, will be appalled that Arriva Rail North have failed yet again to offer any kind of progress whatsoever in the talks and have instead opted to try and bulldoze through their plans regardless. "It is disgraceful that Merseyrail continue to refuse all reasonable attempts by the union to settle this dispute. "Merseyrail have repeatedly kicked all conciliatory approaches by RMT negotiators back in our faces and made it crystal clear that all that they are interested in is the union signing a surrender document which gives them a free hand to rip apart the safety culture on the railway." "Following our meeting with RMT's general secretary, there is no doubt that the trade union calling two days of strikes timed to coincide with people across the North returning to school, college and work after the holidays, will damage the region's economy, significantly disrupt our customers' lives, and impact local businesses. "Northern is prepared to guarantee jobs and current pay for all our conductors for the next eight years, until the end of our franchise. Our offers to discuss every detail on the future responsibilities and training for on-board colleagues have been rejected by RMT. "Northern is modernising with new and updated trains, faster and more frequent services, and better stations from now until 2020. We want to make changes to the on-board colleague role to make it fit for the future, better supporting customers on trains and at stations."